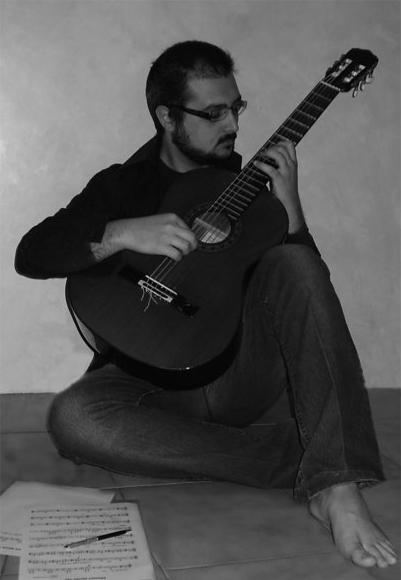 Giancarlo Scarvaglieri composer and player, after having obtained a diploma in guitar at the Conservatory of Palermo under the guide of Marco Cappelli, he has obtained also a degree at “DAMS” University in Bologna. In 2003 one of his works crossed national borders: the “MADRI” Orchestra of Seoul played his Guitar Concert on Neapolitan themes. In 2004 he was selected to represent Italy at the Music Omi in New York City. In August 2006 he won the third prize at the International Musical Contest of Composition “2 Agosto” in Bologna (Italy) with the composition Mozart meets me for flute and orchestra, played by Orchestra Toscanini of Parma directed by Stephan Alltop, Stefano Parrino on flute, broadcast on RAI 3 Italian TV. His composition Reve de Danse was performed on 21st June 2008 at the Werner Recital Hall in Cincinnati. Samyr Guarrera was born in 1976, in Catania, Italy. 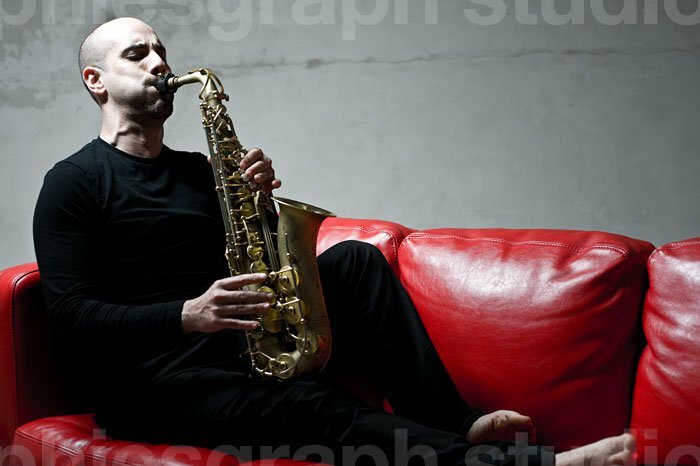 He attended several courses for High Specialization of Jazz Improvisation under the guide of Pietro Tonolo, and Contemporary and Electronic Music under the guide of Carlo Boccadoro, and stages under Paul McCandless, too. He plays Alto, Tenor and Soprano Sax, Oboe, and the Samflute (a reed flute, manufactured just for him). He played in several jazz club in Dresda, Germany, and in a lot of International jazz festivals, too. Since 2002 he has taught Hearing of Jazz Music at school. Angelo Celso was born in 1966, in Catania, Italy. He starts to play drums when he was thirteen under the guide of Pino Minuta. Pucci Nicosia introduced him to American Style, and trained by Marco Volpe, he improved his jazz approaching and other musical languages. In 1990 he got a Diploma in Music theory and solfeggio. He attended several jazz stages of Peter Erskine, Marvin Smith Smitty, Roberto Gatto, Tullio De Piscopo, and also funky stages under Agostino Marangolo, Maurizio De Lazzaretti, Walter Calloni, Christian Meyer’s guidance. In 1997 he attended Berkley courses for Umbria Jazz. In 1999 he won, in Marsala Jazz Festival, the first prize in his category, and the Italian magazine “Percussioni” reviewed his job. Salvo Inzerilli was born on 19th February 1976 in Catania, Italy. He is a guitarist, mainly electric guitar, but he “likes” to play bass guitar and keyboard, too. In the early years of his musical path he played in a couple of local bands performing their own songs. His sound is pervaded by the old psychedelic british rock, but also by progressive and electronic music. In 2009, he started a collaboration with Orazio Longo. 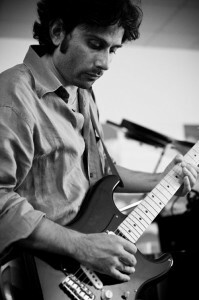 The result of this collaboration led him to play in Longo’s third album, Landscape, realized on September 2010. He was the co-writer of one track of it, Tumbledown affair. He also wrote Voices from Space, the last song of the work. Josè Mobilia was born in 1974, in Catania, Italy. Graduated in drums and percussions. He attended masterclass lessons of Peter Sadlo (Mozarteum of Salzburg), Mike Quinn and Jan Pustjens (Royal Concertgebouw Amsterdam). His interest in people traditions and cultures, led him to play ethnic instruments and jazz drums. His discography works and live gigs include joining with Lautari, Onda Mediterranea e Bandamenano (Montreaux Jazz Festival Off, Festival of Neuchatel, Mood of Zurich, Unesco Theatre of Beirut, Rai Radio3 Suite, Arezzo Wave). 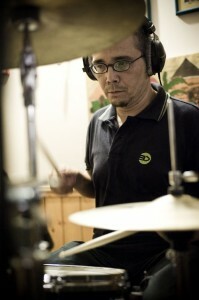 Since 2001 he has taught percussions at schools. 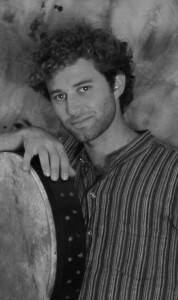 In 2006 he founded the Kilim Music Factory.